With Cinco de Mayo behind us, summer is fast on its way. And after this winter in Philly, I can-not-wait-for-warmer-weather ! 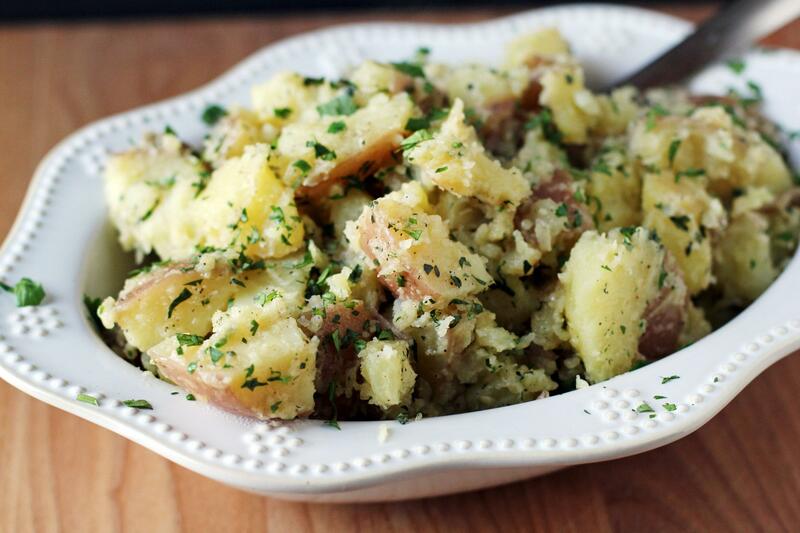 This recipe for cilantro potatoes is one of my summer staples. It goes with everything – steaks, grilled chicken, pork chops. They are buttery, garlicky, and so fresh-tasting. The best thing about this recipe is that it’s highly versatile. If you don’t like cilantro – use minced parsley instead. Or fresh dill. Any soft fresh herb would be perfect with the garlic and the butter. Or hey, if green isn’t your thing, garlic and butter is plenty delicious too. 1. Put quartered potatoes into a large saucepan and cover with cold water. Bring the potatoes to a boil over high heat. Boil for 12-15 minutes, or until tender when pierced with a fork. (I always stab a large potato with a fork and if it slides off the fork without much hesitation, they are done.) Drain the potatoes in a colander. 2. Return the saucepan to the stove over low heat and add the butter. When the butter is melted, add the garlic, salt, and pepper, and saute until the garlic softens, about 1-2 minutes. 3. Add the potatoes back to the saucepan and toss with the garlic butter mixture. Add more butter if needed. Add the fresh herbs and toss to combine. Serve warm.